NexStorm™ is a Microsoft® Windows® lightning detection interface application for the Boltek™ Corporation line of lightning detectors. 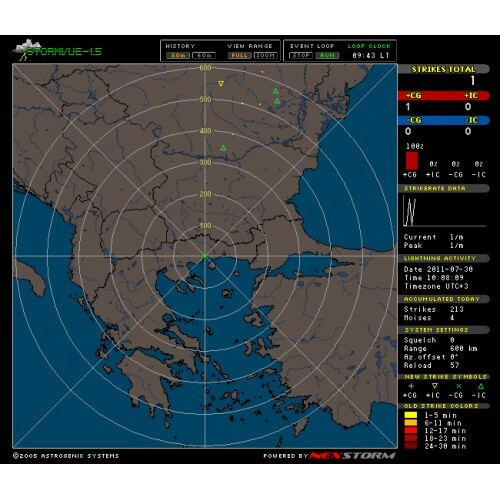 NexStorm™ seamlessly combines advanced analysis and display features with Internet integration and interprocess communication functionality in ways that makes this application not only unique, but also the most versatile and flexible software package for lightning detection that you will find. Individuals and organizations who want to display their Boltek lightning data on the Internet in near real-time, or want to have the option of easy real-time data extraction or customized presentation in various forms will find this software package especially attractive. Add to this the superb thunderstorm locating accuracy, extensive analysis capabilities, professionally designed user interface, no nonsense display of information, superior software support and, not to mention, our added-value StrikeStar™ program, and you'll quickly understand why most lightning detection enthusiasts choose NexStorm™ as their primary lightning display interface!